On Monday, president starts talks with newly elected political leaders, asking who they want to lead next coalition. Unprecedentedly, he’ll do it for all to see. What is he up to? The same is true of coalition governments. Seeing the reality of what goes into them may put you off altogether. That is why President Reuven Rivlin’s decision to broadcast this week’s post-election consultations with party leaders, starting Monday, over whom he should task with forming the government, is a curious one. After every one of the last 20 elections, Israel’s president has met privately with representatives of each party to hear their recommendations for the person to lead the next government. Following the closed-door consultations, the head of state announced which Knesset member he was entrusting with forming a government. 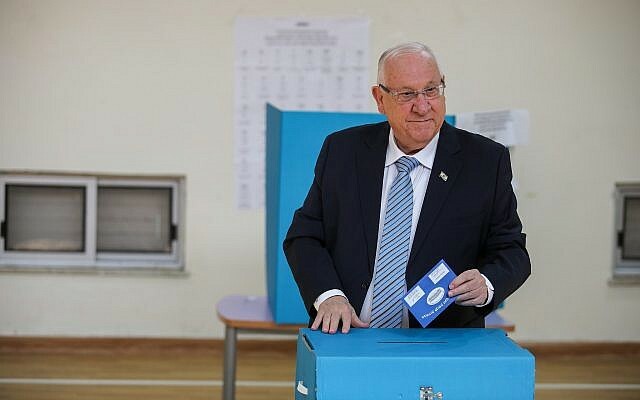 Rivlin wants to do it differently. Does Rivlin, a perennial defender of Israeli democracy and its democratic institutions, really want the public to see him grinding up the post-election machinations and stuffing them into a slippery collagen coalition casing? And, as Bismark cautioned, can Israel’s citizens retain respect for the process, after peering through the butcher shop window? There are three stages to an Israeli election: the voting for parliament; the presidential selection of the potential prime minister; and the coalition negotiations to form a government, with a parliamentary majority. 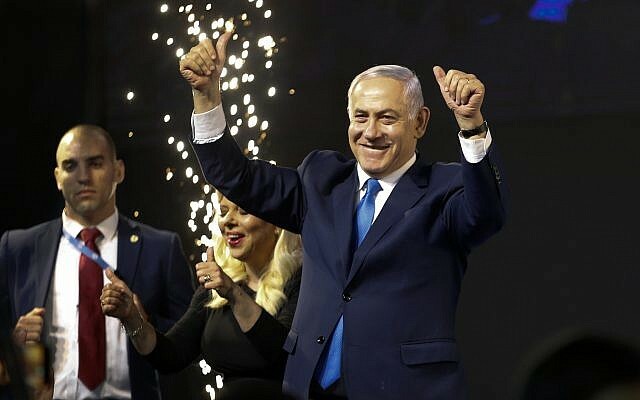 The people of Israel have had their say on the first — giving both the Likud party more seats than its chief rival Blue and White, and the right-wing bloc a clear edge over any possible centrist coalition. To get to the final stage, the president must now choose a candidate he feels has the best chance of translating the election results into a stable government. That person is surely Benjamin Netanyahu. In his victory speech in the early hours of Wednesday morning, Netanyahu, whose Likud won 36 seats in Tuesday’s election, promised that he would succeed in putting together a government made up of the right-wing and ultra-Orthodox partners who have served in his current coalition. Knesset arithmetic indicates that he can do so — Likud, plus the 15 MKs from the Shas and United Torah Judaism parties, plus five from the Union of Right-Wing Parties, five from Yisrael Beytenu, and four from Kulanu would give him 65 seats in the 120-member parliament. So far, every one of these parties but Yisrael Beytenu has said it will recommend Netanyahu. Without Avigdor Liberman’s secular right-wing faction, the tally would be 60 — not quite a majority, but certainly a commanding lead. By contrast, Benny Gantz’s Blue and White — having all but ruled out the two Arab-Israeli parties, Ra’am-Balad and Ta’al-Hadash (and all but been ruled out by them) — can rely only on the backing of Labor and Meretz. While the results put it just behind Likud, its 35 seats increase only to a mere 45 with the backing of the center-left and left-wing parties. Rivlin’s unprecedented push for transparency in the process may therefore be nothing but an opportunity to show the public how he reaches that predetermined outcome. After an election campaign that saw Netanyahu himself suggest that Rivlin may try to subvert the will of the people by “looking for an excuse” to task Gantz with the job, the president may be keen to show that the opposite is emphatically true. 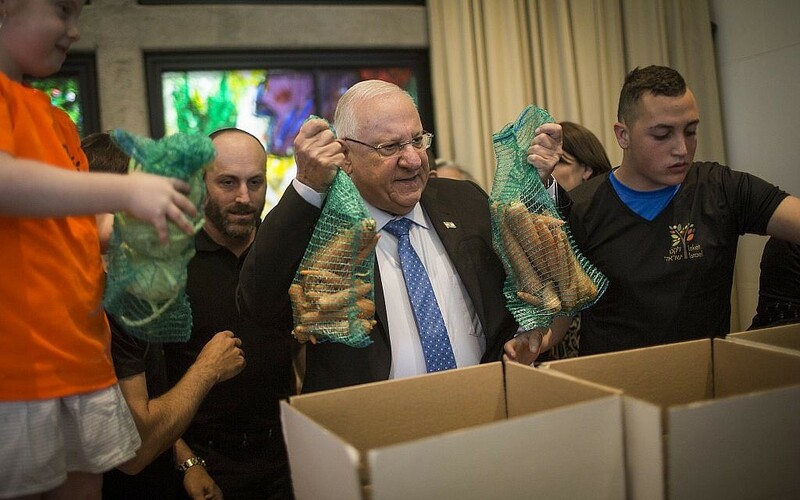 Indeed, delivering a civics lesson last month to 12th-graders in Beit Shemesh, Rivlin said that his role was that of an emissary of the people. “In the State of Israel, and in any democratic state, there is a single sovereign and that is not the government, but rather the people. There are many different views and types of people. As a rule, the president has to take into account what the people wanted in the election, as expressed in the results of the vote,” he told the students ahead of the vote. “The president wants the public to see the process so that he can fulfill his duty in the most transparent way possible,” Jonathan Cummings, a spokesperson for the president, told The Times of Israel on Sunday. Despite what appears to be a foregone conclusion, Netanyahu is still fearful of two other scenarios that Rivlin may see as “what the people want.” And opening the consultations to the public could, just possibly, be an indication that he plans to show significant creativity in efforts to get there. The first is one that Rivlin has suggested may be his preferred option: if no candidate wins the 61 recommendations for an outright appointment (a possibility if Liberman refrains from giving clear backing to Netanyahu), the president may decide to try to force a national unity government. Can the president do that? Yes, with surprising ease. It is completely within Rivlin’s constitutional powers to offer both Gantz and Netanyahu an ultimatum: Agree to a national unity government, dividing the premiership by rotation, or see your opponent get the first crack at premier. 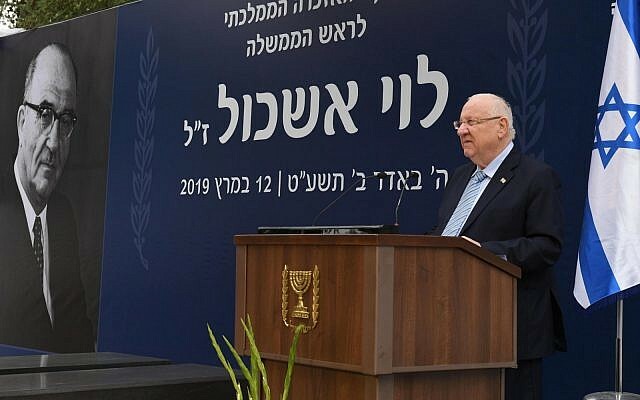 Rivlin’s comments, delivered in a eulogy last month for the 50th anniversary of the death of former prime minister Levi Eshkol, suggested he believes the option to be the best for the country. “Eshkol was not only a party man. From the moment he was elected prime minister, he was the leader of all of Israel. When I say leader, I mean it in the fullest sense of the world: a man with the power to imagine a different reality, a better reality than the current one, and the skill to make it happen. That was Eshkol,” Rivlin said, as Netanyahu sat in the front row before him. On camera, in front of the nation, could they be pushed to say yes? The second scenario that haunts Netanyahu: with a graft charges widely expected to be brought against him within a year of the government being sworn in, it could be argued that he is not ideal first choice to lead a stable government. Attorney General Avichai Mandelblit announced in February that he intends to indict Netanyahu in three separate corruption cases, including on one charge of bribery, pending a hearing that will take place no longer than three months after the election. There is no clear precedent for what may happen if he does, but some constitutional scholars argue that the prime minister would be forced to resign. 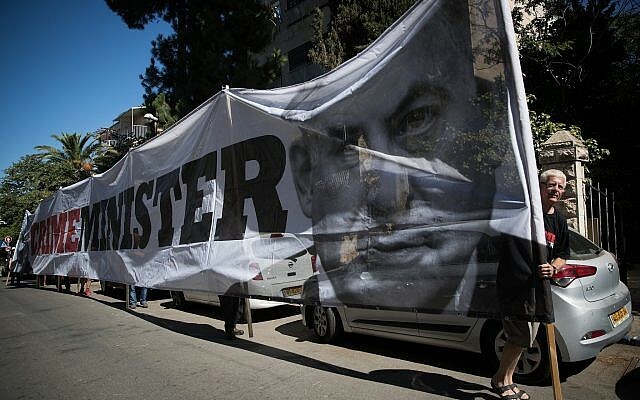 Netanyahu is therefore assembling what some have described as an “indictment coalition” that will prove loyal throughout his legal hearing process and even — if an indictment is served — while he stands trial in the Jerusalem District Court. Speculation has swirled that he may use his newfound political strength to advance legislation that would grant him immunity from prosecution as long as he remains prime minister. He has been reported to be considering conditioning entry to his new government on support for either a so-called French Law, sheltering a sitting prime minister from prosecution, or altering parliamentary immunity laws to automatically protect him from charges. He could also use the existing immunity law — asking his fellow MKs to grant him immunity on the basis of an indictment ostensibly being served in bad faith — for which he would need a simple majority in the Knesset House Committee and then again in the Knesset plenum. Under such circumstances, it would be well within Rivlin’s purview to ask party leaders what they plan to do. Doing so publicly, in front of journalists and streamed live in numerous online feeds, would force Netanyahu’s partners to say on record whether they will stick with him through thick and thin, and whether they plan to provide him with a wedge to keep him in place. If creating a stable government is indeed the president’s chief purpose, it may even be negligent of him not to do so. There would also be nothing stopping Rivlin from posing the question to Netanyahu’s own Likud MKs, who will be representing the party in Tuesday’s talks. By law, the prime-minister-designate can be any of the 120 newly elected MKs. She or he does not have to be the head of the largest party, or even the head of a party at all. Ahead of the February Likud primary, Netanyahu explicitly claimed that popular former Likud minister Gideon Sa’ar, having just returned to politics after a break, had hatched a scheme with Rivlin that would see the president sideline Netanyahu after the elections and task Sa’ar with forming a Likud-led government in his stead. Netanyahu even unsuccessfully pushed to amend one of Israel’s quasi-constitutional Basic Laws, to ensure that only the leader of each elected political party has the right to form a government and not any other figure on the parties’ lists. While an internal putsch against Netanyahu is of course unlikely, Rivlin may want to publicly put the speculation and rumors to bed — or, just maybe, to wake them up.